Amy Gorin, a registered dietitian and nationally recognized nutrition expert, says eating antioxidant-rich foods may play a big role in keeping us healthy as we age. She recommends adding frozen Wild Blueberries to the American diet because this tiny, potent superfruit may help slow the effects of cognitive decline, plus they taste great. Here’s why TODAY is wild about Wild Blueberries. Eating for Longevity: As part of its three-part series exploring foods that promote longevity, The TODAY Show featured Wild Blueberries for their unique, health-boosting properties and literally went WILD for Wild Blueberries. The Maine wild blueberry industry announces a new British study published in Food & Function that shows consuming a flavonoid-rich wild blueberry beverage may help a part of the brain that manages time and attention work more efficiently in children. In a study published in Food & Function, children who consumed a drink containing wild blueberries had a 9% quicker reaction time on the executive function test without sacrificing accuracy. This trial marks the first time researchers have seen the positive impact that flavonoids can have on the executive function of children. Celebrity nutritionist Elissa Goodman, IHN, recommends her Matcha- Blueberry Metabolism Smoothie made with frozen Wild Blueberries as a way to boost metabolism, fat burning and mental clarity. For the Bon Appétit Test Kitchen, frozen wild blueberries fill their freezers and are a guaranteed kitchen staple no matter the season. The culinary magazine notes that wild blueberries are one of the best frozen fruits to bake with because of their small size, and because they don’t need to be defrosted before mixing them into the muffin or cake batter and because they hold their shape once you do. Wild Blueberries have gone from being a blueberry muffin berry, to being recognized as one of the healthiest superfoods you can eat, and the antioxidant benefit is only the tip of the iceberg. This smoothie recipe from registered dietitian Emily Kyle is the ultimate stress reliever and made with good-for-you ingredients that are meant to help you relax and stay calm. Scientists from all over the world gather in Bar Harbor for the industry’s 20th Wild Blueberry Health Research Summit to share their findings. 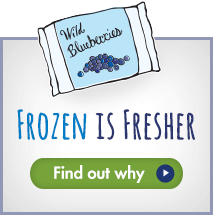 When consumers choose Wild Blueberries, they do it for taste and for the significant health benefits.